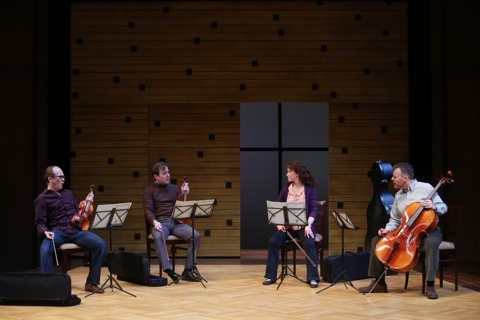 The Repertory Theatre of St. Louis is beginning 2014 with Opus, the story of a world-class string quartet on the eve of a high-profile performance. I was curious to see this production, with its unique focus on an aspect of the arts world that I didn’t know a lot about, and as is often with the Rep, I’m impressed with its quality. This is a fascinating, well-structured play that explores the members’ relationships with one another, with their instruments and with music itself, brought to life by a truly excellent cast. Opus focuses on the fictional Lazara Quartet. They’re world-famous, but struggling with an identity crisis after their brilliant but volatile violist Dorian (Matthew Boston) mysteriously disappears after being fired by the quartet. The talented but relatively inexperienced Grace (Rachael Jenison) is hired to replace him, and the dynamic between her and the three remaining members is explored while the history of the quartet and Dorian’s departure are recounted in flashbacks. The quartet is a mixture of contrasting personalities—the insecure, egocentric first violinist Elliot, the more laid-back second violinist Alan (Greg Jackson), and the affable cellist Carl (Chris Hietikko), along with the initially timid but determined Grace. When the quartet is invited to play a high-profile concert at the White House, tensions are brought to the forefront as the quartet works on a notoriously difficult piece of music, Beethoven’s Opus 131, or String Quartet No. 14. The play is structured in a non-linear fashion, but with an evident framework in which a problem or issue is presented in the present day and then followed by a flashback that further explains the issue, such as the rocky romantic relationship between Dorian and Elliot, and something of a strange “love triangle” between Dorian, Elliot, and Elliot’s priceless violin. Other interpersonal dynamics are explored, such as a possible flirtation between two other quartet members, a struggle for power and influence in the quartet, Grace’s conflicted career ambitions, and one member’s ongoing health issues. Throughout all these personal issues, the music remains the catalyst that keeps these disparate characters together. The play also cleverly uses Grace’s introduction to the quartet as a way of explaining their workings to the audience, which, since I am not a classical musician, I find extremely helpful. As is fitting for a play about a renowned musical group, the ensemble here is universally excellent. It’s very difficult to single any one performer out, since the actors work so well together and get their energy from one another. Jackson’s Alan serves as something of an emotional center to the play, and Jackson brings great charm to the role, with Jenison also extremely strong as the eager-to-impress Grace, and Hietikko extremely impressive as family man Carl, who functions as something of a peacemaker in the group. The play’s central relationship and source of conflict, though, is between Dorian and Elliot, who are portrayed with much dynamic energy by Boston and O’Neal. Boston, with his determined, strident emotions, and O”Neil with his over-the-top manic fastidiousness ably drive the play’s central conflict. I loved the dynamics between all the players here, as the tension builds to that one fateful performance and it’s shocking aftermath. Like a good string quartet, this show is truly an ensemble piece, with all the players showing their different complementary strengths and contributing to the overall beauty and poignancy of the production. The play as written has a few issues that could be problematic, with the expected “types” of characters (the naive young initiate, the brilliant-but-troubled musician, the player and the family man, the rocky romance, etc. ), but in the hands of the great actors and excellent direction, the characters transcend their types. The drama builds believably, making the audience root for the performers and their upcoming White House gig. Even the one plot element that I was expecting all along (which happens late in the play) was done in a way that still shocked me, and the end result is a riveting drama that sheds insight into the relationships between artists and their work, as well as the importance of the rehearsal process in the creation of any great performance. This play also shines, for the most part, in its technical aspects. The gorgeous classical music is very well played on recording, and incredibly well-synced with the actors in the playing scenes, except that the actors could do a better job looking like they’re playing (their bows are frantically moving but their fingers on the necks of their instruments hardly move at all). The set by James Kronzer is simple but very evocative of classical performance spaces while adding a somewhat otherworldly element, with its shiny hardwood floor seeming to float amid the dark polished tiles surrounding it, and with projections (mostly close-ups of instruments) appropriately complementing the action, and the costumes (by Holly Poe Durbin), ranging from everyday clothes to tuxedos and gown for the final performance scene, add to the overall atmosphere of the classical music world. 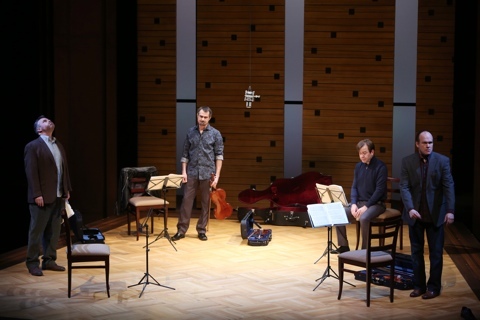 Overall, I would say this play helps to enlighten the general public to the dynamics of the creative process, particularly in the little-known world of the classical string quartet. This production at the Rep tells a compelling story and effectively gives the audience a small window into both the mundane and the extraordinary in the lives of artists. It’s another strong entry in the Rep’s impressive current season.